Last month, global leaders in business, government, media, and technology made their annual pilgrimage to Davos, Switzerland, for the World Economic Forum’s annual event. The tranquil mountains surrounding the city stood in sharp contrast to the swirling populist storm that is now transforming geopolitics. Indeed, the event’s long-held objective—to improve the state of the world by promoting open borders, global cooperation, and free trade—felt strikingly at odds with the nativism and isolationism expressed in Brexit and the election of US president Donald Trump. The new right-wing populists have many bogeymen—immigrants, refugees, and what they perceive to be corrupt and ineffective international institutions, to name a few. But look past these scapegoats, and a troubling reality emerges. It is not trade or immigration, but rapid technological progress—turbocharged by globalization—that has left many people behind. The truth is, the track record for the Internet is complicated at best. It has democratized access to information and transformed the way we communicate, but it has also led to the erosion of privacy. It has spurred the creation of Silicon Valley juggernauts, but failed to create broad-based prosperity. The challenge that lies ahead is how to make globalization (and, ipso facto, technology) work for everyone, not just privileged few. The blockchain, a decentralized ledger that verifies and permanently records transactions, may help us achieve this goal. In fact, the democratizing potential of this technology could be key to ushering in a new era of globalism. 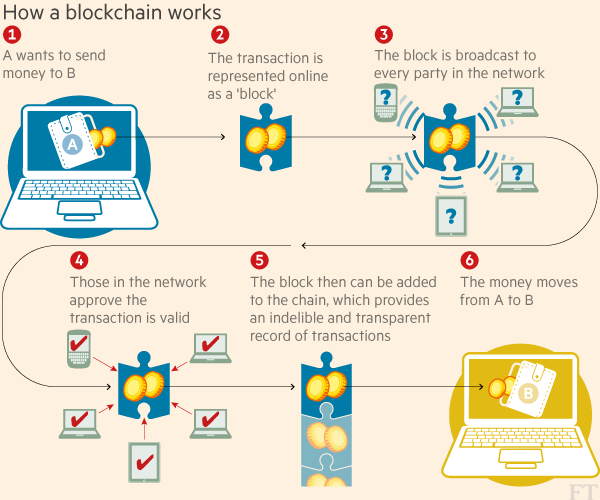 The blockchain was developed as the enabling technology behind cryptocurrencies like Bitcoin. It is capable of carrying not just information but also anything of value. Money, titles, deeds, votes, and intellectual property can be moved, stored, and managed securely and privately, as trust is not established by powerful intermediaries like banks and governments, but by consensus, cryptography, collaboration and clever code. If the blockchain becomes more widely used, billions of marginalized people will have a better chance of entering the global economy through financial inclusion and the strengthening of property rights. Wealth for the world’s poorest will no longer be tied down by the limits of cash in the grey economy, as more people will have the means to make payments, store value and access credit globally. Rather than trying to solve the problem of growing social inequality through redistribution alone, we can change the way wealth—and opportunity—is pre-distributed in the first place. Farmers can connect to global supply chains. Musicians can get fairly compensated for the content they create. We can build a true sharing economy where the creators of value actually share in the wealth these new platforms create. The list goes on. In this regard, the promise of blockchain technology is heartening. It includes significantly lowered transaction costs, and broader financial access for individuals and companies; strengthened financial and social stability through greater economic participation; stronger economic activity; and the enhancement of appropriate transparency, security, and privacy. Among other things, these transformations could usher in a halcyon age of entrepreneurship, as small companies anywhere in the world can have all the capabilities of big companies without the corresponding liabilities, such as deadening bureaucracy or legacy culture. At the same time, the blockchain is not a panacea for the world’s problems. And of course we see the irony in positing that this new technology could help us address our social and economic issues, when previous technologies have fallen short of the mark. Ultimately, technology alone does not create prosperity—people do. Leadership and stewardship will be required to ensure that blockchain technology meets its positive promise. Our firm belief is that this calls for continued commitment to global cooperation, not disengagement. This is folly. Without concerted and focused effort, there is a danger this powerful new technology will fail to deliver on its promise. Leaders of the old paradigm might try to stop it. Governments may try to crush it. Perhaps the greatest risk is that the technology will never make it to prime-time, as competing fiefdoms inside the nascent blockchain community advance their own narrow self-interest at the expense of the ecosystem as a whole. None of this is meant to dissuade us from pursuing the technology, but rather to highlight the challenges that we will need to plan for and overcome—via inclusive, meritocratic and bottom-up multi-stakeholder governance. The members of our group intend to bring this focus to our work together, and to reach out to others in our respective communities to join us. The world is in the throws of great change, and we intend to do our part to ensure that our contribution to that change is positive. The time is now and we need your help. Please join us. The signatories below are members of the World Economic Forum’s Global Futures Council on Blockchain, which was formally announced at Forum’s signal event held at Davos, Switzerland in January, 2017. We are a diverse group of stakeholders that includes regulators, businesspeople, investors, academics, entrepreneurs, and representatives of open-source communities.